I’v been a customer of Geoff and his friendly and professional staff for over 4 years now and would recommend them to anyone that needs affordable and safe storage. Always a pleasure to deal with. Nothing is too much trouble. Cannot speak highly enough of Geoff and his team. They went far beyond my expectations - excellent service and excellent facilities. My nomination for business of the year! It is not often, in this modern world, that you find a company with that good old "We care" attitude. The Geoff and the tream at Ferrymead Storage King belong to that rare breed. When I needed storage space in a hurry Ferrymead Storage King was there to "make it happen". After securely looking after our possessions for 3years, they were also there to facilitate the removal. There is no better recommendation than a satisfied customer and I can honestly sat that I have been extremely satisfied. 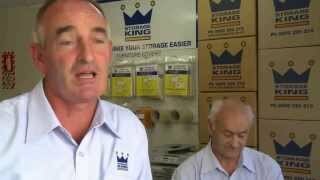 Storage King Ferrymead has your simple storage solution! Storage King Ferrymead proudly services Woolston, Linwood, Waltham, Phillipstown, Sydenham, Christchurch, Christchurch Central and Spreydon.